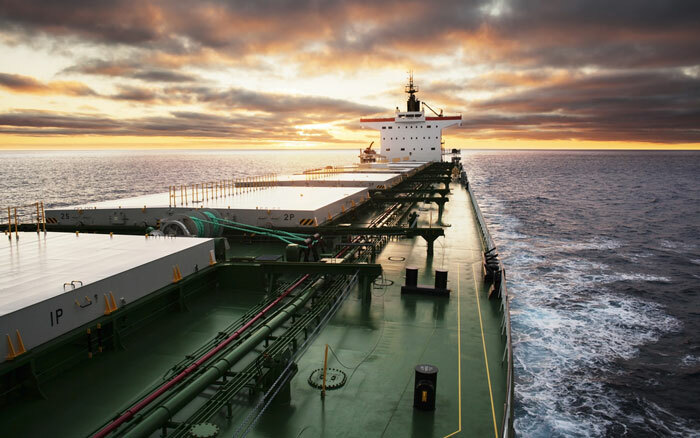 Anchoring is as frequent operation on board as loading and unloading a cargo. But in spite of being a frequent operation, the number of incidents related to anchoring never seem to reduce. That is when many minor incidents never come to light to a wider audience. The truth is that even after being a routine operation, effective way of anchoring is not a child’s play. Sure one can just somehow arrive at anchoring position and open the brake to anchor a ship. I am sure you would agree that it is not an effective way of anchoring. Don’t you think so? In this post, let us discuss a practical way of anchoring. But before we do that, we need to discuss two things. First how an anchor holds the ship. And second what guarantees more holding power of anchor. When an anchor is dropped, The crown of the anchor is the first to hit the sea bottom. As the ship moves back, the flukes take its position and embed itself into the seabed. It does not matter from what height the anchor is dropped, the crown will alway hit the bottom first. The flukes will only dig into the seabed once the ship moves aft and flukes are facing downwards into the sea bottom. As the ship moves back, the fluke takes its position and embed itself into the seabed. The opposite happens when we pick up the anchor. When the chain is all picked up, the flukes face upwards and gets uprooted from the bottom. All other factors being common, there are three things that affect holding power of anchors. First is the construction of anchor, second nature of seabed and third the scope of the cable. A ship’s Equipment number decides the weight of the anchor and length of the chain. The fluke area determines the holding power of the anchor. 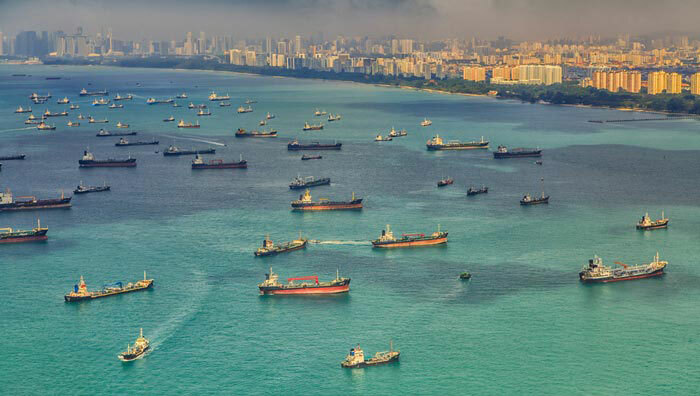 International Association of Classification Societies (IACS) governs the rules for anchors. 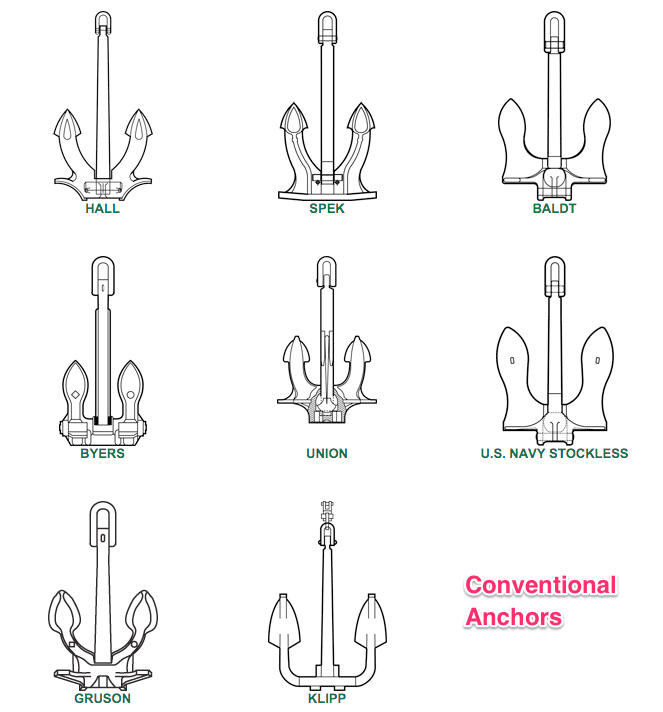 IACS enlist three types of anchors. Super high holding power anchors. 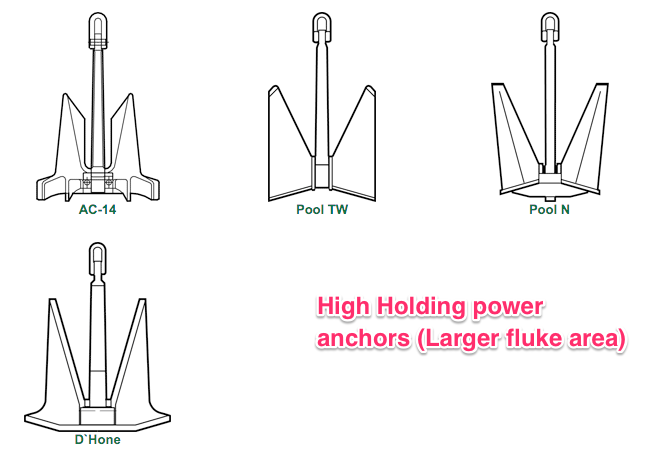 Because of the high and super high holding powers, these anchors can have a lesser weight than the normal anchors. This is because the high holding design (Larger fluke area) compensate for the loss of holding power due to lesser weight. This is because the high holding design (Larger fluke area) compensate for the loss of holding power due to lesser weight. Even though anchor weight has nothing to do with holding power per se, it contributes to some extent in holding a ship in its position. More weight of the anchor would need more force to push the ship from its position. For this reason, anchor weight is more often used as a function of holding power. Another factor that affects the holding power of the anchors is nature of seabed. Sand is considered to be the strongest holding ground. Soft mud is the least holding ground. This is because of obvious reasons. Anchor embedded into soft mud would leave the bottom easily compared to the more harder surface like sand. 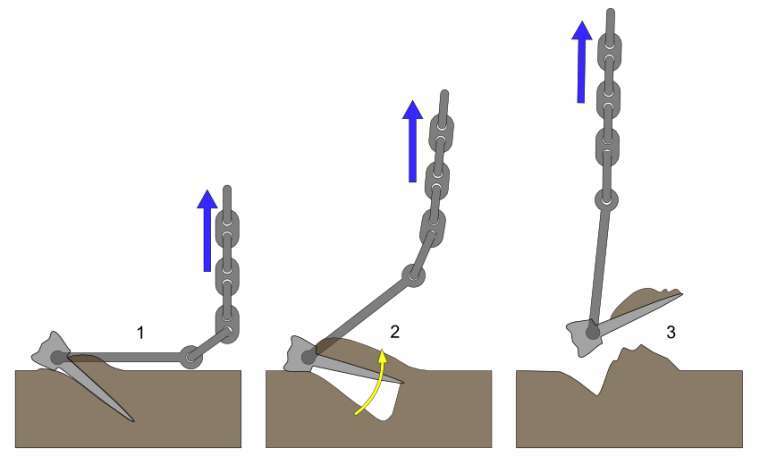 Mariners must consider nature of seabed to determine the possibility of dragging of the anchor. The correct scope is essential for safe anchoring and better holding of the anchor. The scope is the ratio of the depth of the water to the length of the cable deployed. More the scope, better an anchor will hold the ship. 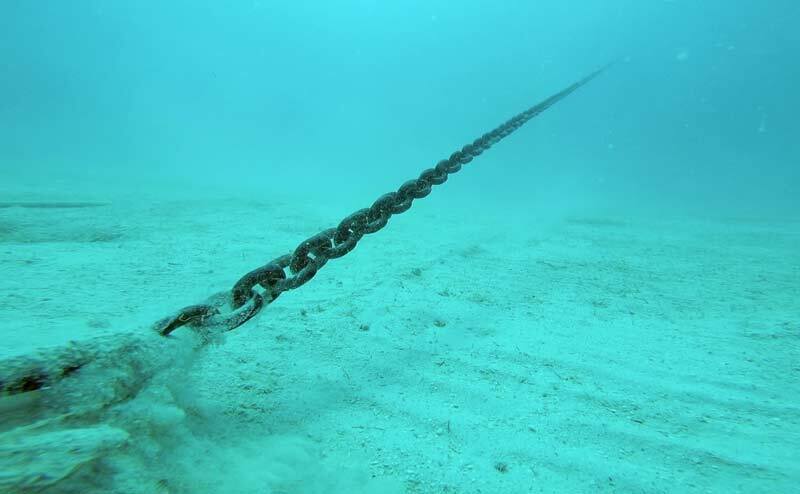 The idea of having more scope is that the angle of chain with respect to sea bottom should be minimum. More the angle, lesser the holding power. OCIMF has published a graphical relation between this angle and holding power of anchor. As a thumb rule, Scope of 6 is advisable for anchoring. That is when anchoring into a depth of 20 meters, we should pay at least 120 meters of cable. When anchoring in areas of strong wind or current, we should have a scope of more than 6, up to 10 sometimes. There are two situations where the scope of 6 or more may not be always possible. in deep water anchorages like Fujairah. In congested anchorages, this is due to insufficient sea room and In deep water anchorage due to insufficient cable length. In calm weather, the lesser scope in these areas should not be a problem. But if you expect wind force to increase, increased possibility of anchor dragging should be part of the risk assessment. Now that we have discussed few of aspects of anchoring, Let’sLets anchor a ship. Preparing the vessel for anchoring can start days before arrival. This is when a Master checks the charts for marked anchorage areas days before arrival. When checking the charts for underwater obstructions, attention should be paid to the chart symbol ‘#’. This symbol means there is a foul ground and shall be avoided for anchoring. I am particularly mentioning this chart symbol because you may not miss a wreck but it is easier to miss this. It is important to be aware of the ship’s windlass lifting capacity. In any case, most of the ship’s windlass are able to lift the weight of the anchor and about 3 shackles. Vessels could easily anchor in depths of about 80 meters. If anchoring in depths more than that, you might need to first check the windlass capacity for the particular ship. Anchor stations should be ready forward well in advance. The anchor party should make the inspection of the anchor windlass. They should also ensure that the drive (Hydraulic power packs or electric power) is running. The lashing of both the anchors should be removed even if it is pre-decided about which anchor will be used. the number of shackles the vessel will be brought up to. 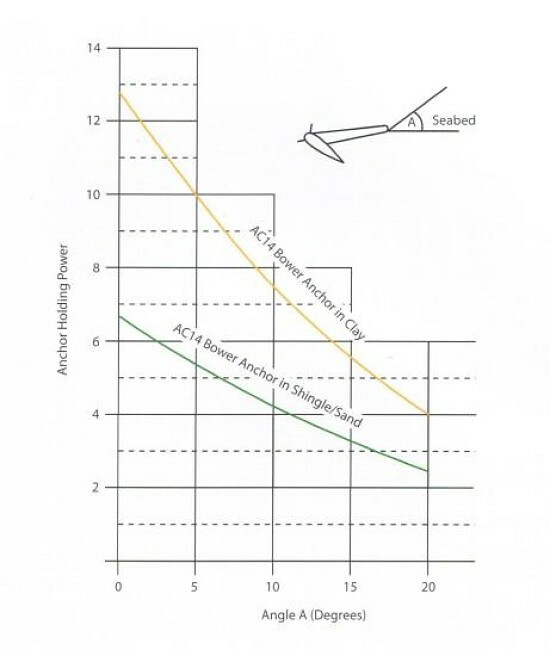 The most critical factor while approaching anchoring position is the speed of the vessel. Engines must be ready and tested well in advance and the speed of the vessel should be under control. If Master feels the ship’s speed is much more than what it should be, he should exercise zig-zag maneuver to reduce the speed. While doing rudder cycling, the master must give due consideration to the nearby ships and not run over other ships in the vicinity. 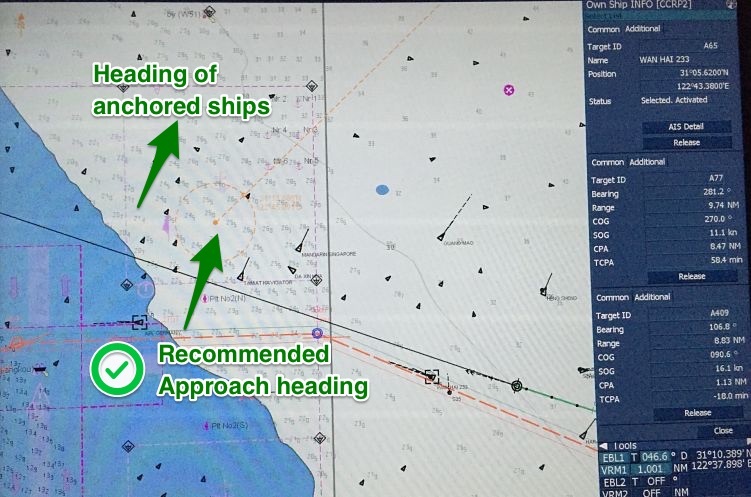 If the traffic density, water depth, and sea room permits, it is better to bring the vessel to this heading at least 1 mile from the anchoring position. Once on this heading, engine movements should ensure that vessel’s speed is less than 2 knots about half a mile from the anchoring position. Once the vessel is around half a mile from the anchoring position, we can give stern movement. This is to ensure that vessel is completely stopped at the anchoring position and there is no headway in the forward direction. During Stern movement, the vessel would cant to starboard side (for right hand fixed pitch propellers). If we are using the port anchor, this is good as this would ensure the cable is clear of the vessel and will not lead across the bow. But if starboard anchor is used, there is a chance of anchor chain going under the bow or crossing the bow. In this case, before we give stern movement, vessel’s rudder is put to hard port to get some port swing. The stern movement would check the port swing and the cable going under the bow can be avoided. Make sure to bring the rudder to midship during Stern movement. Apart from lateral swing, stern movement of the vessel itself ensures that the cable is clear of vessel’s hull. However, in all cases, we must ensure that movement of the vessel does not put excessive strain on the windlass. We will discuss this in the next section. As we know, there are two ways an anchor can be dropped to the seabed. Each of these ways has its advantages. And in most of the cases, it is up to the discretion of master how he wants to anchor. But there are certain conditions in which there are no options but to choose a particular method. Would you agree that anchoring by letting go is easier of the two methods? It is the most used method of anchoring too. In this method, we open the windlass brake to let the anchor go under gravity. Before opening the brake, we must consider the height from which we plan to drop the anchor. If we don’t, we may damage the anchor. Depending upon the height, the damage may not be visible in the same operation but will be visible in the longer run. More the height, more momentum the anchor will gain. This momentum may increase to a point where windlass break would not be able to hold it. The anchor’s momentum will only stop when the anchor along with entire chain is in the bottom after it has been uprooted from the bitter end. What is the referencing height then? As a thumb rule, you should never allow the anchor to drop from a height of 20 meters. That is, one must lower anchor to a level when the distance between the bottom and the anchor is not more than 20 meters. But that is a maximum figure. One must lower the anchor to as close to the bottom as possible before it is let go. But if you aim for lowering the anchor to say one meter above the seabed, you may end up touching the anchor to seabed while the ship still has some speed. So here is another rule of thumb. We should aim for lowering the anchor to around half shackle from the bottom before we let go. Approach the anchor position heading into wind and tide with speed around 2 knots at 0.5NM from the position. Give Stern movement to stop the vessel over the ground once the vessel is in the anchoring position. if using starboard anchor, check the starboard swing (for Right hand fixed pitch propellers) because of Stern movement. maintain around 0.5 knots stern speed to allow the cable not to pile up. Hold the break once required cable length is paid out. Walking back means lowering the anchor with gear. The principle difference between walk back and let go methods is that in the walk back we lower the anchor under power. The advantage of this method is that cable would not run on its own. So there is no risk of damaging the anchor or windlass by dropping from a height. But there is another risk involved with this method. I earlier said that in the “let go” method we should maintain around 0.5 knots astern speed while we are paying the anchor chain. But even if we exceed this speed to 1.0 knots, only the anchor will pay off. There will not be any load on the windlass. Even when the brake is on, and the chain stresses, windlass brake will be the first thing to render. But that is not the case with walk back method. In walk back method, since we are lowering the anchor with windlass in gear, excessive speed would surely damage the windlass. We must not exceed the stern speed to more than the design speed of the windlass. Typically the design speed of windlass is 9 meters/minute. That is 540 meters/hour (0.3 knots). So we must not exceed the stern speed to more than 0.3 knots while walking back the anchor. Once we have lowered the required anchor length, and we have disengaged the gear (in the case of the walk back), we then wait for the anchor to be brought up. The anchor is brought up when it leads to the long stay and then gradually comes back to short to medium stay. Once brought up, there is an important thing that we need to do. Put the bar (Bow stopper) on and rest the anchor chain on it. This is because the load generated by the vessel’s movement during its stay at anchor should be borne by the bow stopper which has higher capacity than the windlass system. There is a disadvantage though. In heavy weather, there are chances that stopper may jam or deform. In this case, if for some reason vessel needs to let go the cable in the emergency, it would be difficult. There have been incidents of total constructive loss due to master’s decision to stay at Anchorage in spite of adverse weather warnings. Anchoring is a routine job. Number of incidents during anchoring or while at anchor suggest that we might not have yet mastered the art of anchoring a ship effectively. Knowing the correct anchoring procedures and their limitations are one of the best ways to avoid anchoring related fatalities and damages. Dear sir, very very useful . thank u soo much. we need something about what is squat , squat calculation, how to calculate ukc available etc. Glad you found it useful Karthick.. I will definitely right on squat as this is another important topic. I also believe that the weight should be on the chain stopper as it is designed to withstand much more than brakes. (Chain Stopper (Guillotine) = 80pct of Chain MBL Brake band = 45pct of Chain MBL). Plus I have witnessed, leaving a gap results in a high probability of deformation in the chain stopper as the slip distance is much higher (greater momentum) as compared to the cable snugly resting against the stopper in case the cable runs out under excessive load. The same is also recommended method for securing the cable, in the concerned publication. That is a good point made there. While the OCIMF publication recommend having the chain rest on the stopper it does not however say that other way is incorrect. It compares and contrasts between two methods. But as I said I also prefers it to be resting on the chain stopper. Thanks for giving your valuable views on this. Hi Bob. In normal conditions It does not actually matters which anchor we use as finally vessel will be stemming the the resultant of all the forces (Current, wind, tide). In case of anchoring in a river closer to the shore (like in Mississippi) , we normally use off-shore anchor so that it can hold the ship from dragging into the shore..But we normally use anchors on alternate basis so that we are sure that both can be used when required. Regarding 2 anchors, Yes it is class requirement to have 2 anchors. Apart from having other anchor in case one cannot be used, we sometimes have to use both the anchors specially in river where we cannot allow the ship to turn because of less space or strong currents. We also use for turning the ship where tugs are not available and for that we may require anchor on a particular side. We also use anchor for mooring in the river ports so that while casting off the ship, it is easier to bring the ship off the berth which otherwise may be difficult because of current pushing the vessel onshore. There are plenty reasons to have one anchor on each side. Dear Sir, I find information in your blogs very useful and very informative and to the point. However regarding anchoring procedure could you please elaborate on best anchoring time when we have some tidal range. for example if 0700 is LW and 1300 is HW and tidal range is 6 meter, what would be the best time to anchor and reason behind it. Ashish, if you are looking for an objective answer to this, there is none. A ship can be anchored any time. If I had the privilege to choose the time I would choose just before the low water or just before the High water (Slack water time). The Tidal current would be minimum and I can handle the ship without any concern of strong current. Also the forces acting on the anchor while it is being brought up will be minimum. On the other hand if ship is going up river and need to drop anchor, it is easier as I can use the current to my advantage as with against current, I can always use the engine and not loose steering and still be able to maintain less ship speed. However I would avoid anchoring in time of strong tidal current if ship is bound down river as then I need to turn in the strong current. Glad it could be some help to you Shishir.. While calculating the turning circle of the ship at anchor, we take the length from the forecastle to the bridge into account. If we add this distance, it takes into account this error you are referring to. Hi Adam, The anchoring part is detailed in this post. Arriving from a long voyage would add checking & testing the anchoring equipments well before arrival for anchorage. Let me know if there is any further question on this subject. Thank you sir that's much appreciated. What I was really after was the full sequence of events leading upto this event happening, I need to put a proposal together and then execute the anchorage for my presentation. Would it be easier to email me info your time I'm very greatful for. In practice, It does not really matter. We can use any anchor. Finally, the ship will adjust itself to the resultant of both the wind and the current. Same here Kelvin. I have never used Baltic Moor. Recently during promotion interview to Master, a friend of mine was given a situation of anchoring a loaded VLCC, in Singapore anchorage while approaching from West. The current was setting at 3 kts, 330 degrees and wind experienced was force 4. What could have been the best approach heading and which side anchor would have been best to be used considering the above situation. Comments from experienced Captains would also be appreciated as i am having my interview and simulator test next month. Head to the current. Ideally, you can use any anchor but in a very strong current, it is advisable to use two anchors. If I have to choose one anchor, I would choose the opposite of from where the wind is coming. If the wind of from the port side (when we head to the current), I would choose the starboard anchor so that the anchor does not allow the wind to turn the vessel and expose the ship's bow to the strong current. Dear capt, A question about anchror operation to be fully automatic remote operation from bridge, I had a doubt about this function. 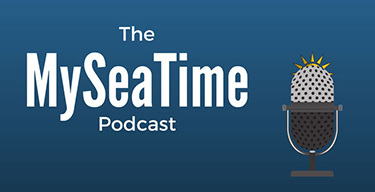 Does it mean no seaman working on the fore mooring deck when automatic anchor operation from bridge ? does the anchor stopper need remote operation from bridge for meeting anchor fully automatic operation function? thanks. I have never come across this but I guess this would be only on small ships or tugs. On bigger ships I don't think it would be safe to anchor without anyone forward. Great article about anchoring a ship and it is very useful to know it. Thanks for your sharing and waiting for your new excellent articles. There are different anchoring methods to suit different needs, and it is necessary to learn and know them before you do the anchoring work. Excellent article Sir. Would there be a guideline between anchor weight/size and vessel DWT you could share? Obviously depends on anchor type. It is based on the equipment number of the vessel. 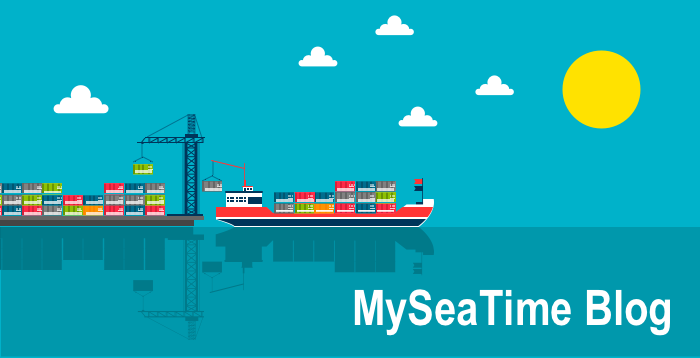 Classification societies calculate the equipment number for the vessel and the weight of the anchor, as well as the length of the chain, depends on that. Excellent post, one correction, the Scope of the anchor cable is the ratio of the length of the cable to the depth. Its vice versa in the article. What is normal or good practice for securing anchors for sea and/or bad weathers? Should it be coupled in or not? Does any guides sais about it? Both ways have its advantages and disadvantages. OCIMF mooring equipment guidelines recommend any of these methods. Very useful info. Sir. I have a ques? Suppose depth is 100 metre then what is the formula for putting shackles? And formula for making swinging and dragging cirle? I have discussed the swinging circle on this blog. How to know if the anchor is dragging? It is done with the help of shore crane. Ship staff needs to continue lowering the cable and someone from the drydock will signal when to stop lowering and resume lowering. Finally, the bitter end is released while the shore crane is holding the anchor chain. I would like to know what is the rule of thumb "clearance of anchor chain stopper from the anchor chain. This has become the favorite learning site of mine. Presently I am doing my class II orals for chief mates and found this site is utmost important. Wish I could find all the answers to all my questions. Kindly add more topics. Best of luck sir..
Glad it is helping you. 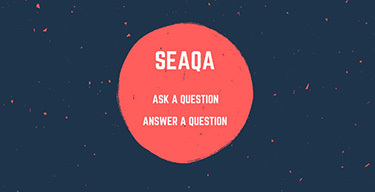 If you have any questions you can ask those on SEAQA section of the website. What is the typical scope of chain veered for a ship anchoring in 12 fathoms of water? The answer is 70 fathoms. Can you explain why? Hello Sir, could you explain how to weight the anchor? What happen if the scope is 4/5, the boat is at the maximum distance and you try to weigh the anchor? Is the windlass able to move the ship towards the anchor ?